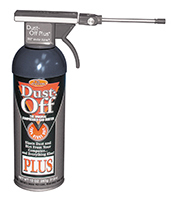 Dust-off® general purpose cleaner with difluoroethane (152a) as active gas. Widely used in microscopy labs. The unique Dust-Off® multi directional nozzle can be angled and rotated for optimum delivery of the cleaning gas. Ideal for cleaning microscopes, precision instruments, computer parts, samples etc. Does not contain CFC's or HCFC's, 100 % Ozone safe - flammable. 10oz canister. Refill canister and nozzle also available separately. Export: By Air Cargo or U.P.S. Ground. Ultra-clean, no residue, non-abrasive, moisture-free gas for removing dust and other particulates from samples, microscopy slides, lenses, film, optical instruments, electronic parts, etc. in laboratory, service and manufacturing applications with jets of pin-pointed gas. Contains Dustex 8, a 100% ozone safe, ultra-pure gas, flammable, no CFC's, no HCFC's. Delivers up to 70 psi blasts. Excellent value with large 12 oz. (340ml) container for more cleaning action. Export: By Air Cargo or U.P.S. Ground. GUST 360° Spray Anyway Duster lets you spray from any angle - even upside down- without frosting. Contains Dustex 11, a 100% ozone safe, non-abrasive, inert, moisture-free, ultra clean gas for precision cleaning, no CFC's, no HCFC's. Suitable for removing dust, lint and particulates from microscopes, cameras, precision parts, electronic equipment and other delicate parts from any angle. Delivers up to 80 psi blasts. 8 oz. (187ml) canister. 100% HFC's. No CFC's, no HCFC's, ozone safe. Nonflammable, no residue, moisture-free, nonabrasive, odorless. Zero ozone depletion potential. 10 ounce aerosol. Noncorrosive. Safe on most plastics. 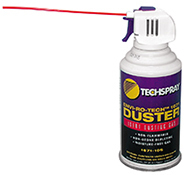 Nonflammable, ultra-filtered, no residue, ultra clean gas for precision removal of dirt, dust, lint and particulates. Suitable for delicate electronic devices, photographic equipment, microscopes, clean rooms and laboratories. Delivers up to 100 PSIA at 20°C (68°F). No HCFC's or CFC's, ozone safe. Net weight 284g (10 oz.). Small, handy device which blows air when compressed. Dusts off photos, EM articles. Avoids use of CFC's. Fine tip for difficult to reach areas. Will not roll off the bench. This Rubber Blower has a metal nozzle and inlet valve. The nozzle is plastic-sheathed to prevent marking of delicate parts. Provides a strong, directed air stream for cleaning when the bulb is squeezed. 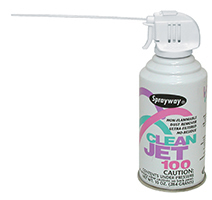 A substitute for pressurized cans. Swiss made. Nylon-covered braided air hose with 1/4” NPT female ends. Can be used with dry compresed air or nitrogen. If a dry nitrogen line is available in the lab use this air gun to blow away dust particles. Great for all around use, gun has a hang-up hook and Brass safety tip with vents to let air escape. This blowgun meets OSHA requirement 1910.242 (b) directive 100-1 when used with this safety tip. The trigger control lets you vary airflow from a puff to a blast. Body is polished die cast aluminum with a nonslip vinyl surface pistol grip. The 1/8" NPT Male end screws directly into Pistol Grip Nozzle to deliver a precision stream of air directly to your specimen. Needle Nominal O.D. Nominal I.D. 13 2.413 0.095 " 1.803 0.071 "
18 1.27 0.05 " 0.838 0.033 "
19 1.067 0.042 " 0.686 0.027 "
Turns wet dirty air into clean dry air with a four stage filter. 1st stage removes dirt, 2nd stage removes oil vapors, 3rd stage removes water vapor, and 4th stage removes residual desiccant dust. Used at the point-of-use, this patented, disposable, Mini In-line Desiccant Dryer/Filter removes all traces of water vapor, oil vapor and dirt. It is often used directly upstream of blow guns or spray guns as final protection for critical parts blow off and paint spraying. Install in either direction; it functions in both directions. Keep the hose free of snags. Extra tension on the dryer/filter could break the unit at the connecting ports. A 40 micron, porous bronze element removes fine dirt particles; an oil removing media removes oil vapor; and desiccant beads absorb water vapor. The see-through housing shows desiccant color change, which indicates that the dryer needs to be replaced. Replace when dark blue color changes to light transparent color.